Another cut paper person! This lady looks like she's pondering some significant issue. I really never know how each one will turn out, but each starts with a pencil drawing, usually inspired by a magazine or newspaper photo, but not directly copied. The paper I use is usually scrapbooking paper from an art or craft store. I know my blog is about fabric, so I'm thinking that paper is made from fiber - in any case, I'm enjoying playing with paper lately!! Today was a gorgeous day here in New England - bright, sunny, a bit chilly, but very uplifting. My poetic friend, Elaine, commented yesterday that "the maple trees are putting on their green lace gowns." I think about that every time I sit on my porch and look out at the trees. So beautiful. Another fused fabric picture, done a while back, but still one of my favorites. It measures about 4"x 6". I used Pellon Wonder Under to fuse everything. 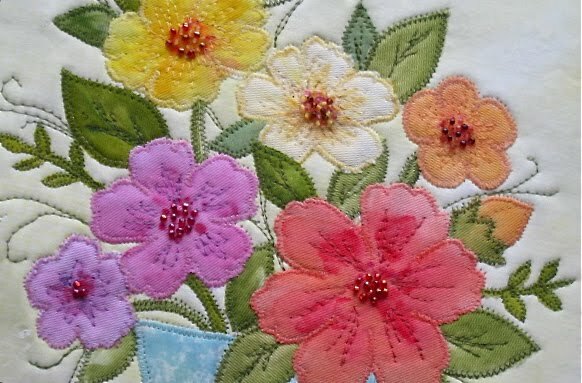 I've used this product for over 20 years and love the way it gives the fabric a crispness which helps when cutting out small shapes. Recently a friend asked me to do a tutorial on this, and I plan to get one together soon! 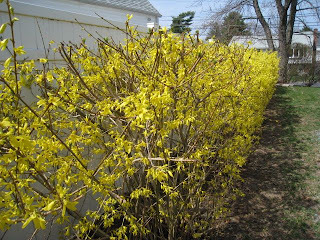 Our hedge of forsythia bushes suddenly burst into full bloom in the last few days!! I see the tiny buds on surrounding trees and bushes, but these yellow beauties are always the first to make an appearance, in a very showy way!! As I sit on my little back porch, I can hear the birds twittering in the branches and feel extremely peaceful. 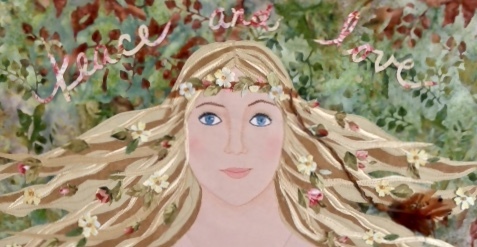 I'm working on a couple of art projects and some changes to my blog. So, if you're a reader, please don't give up on me!! I'll be back to regular blogging very soon! I sent my friend Janice this ATC as my offering for March. I always think of Spring as being somewhat etherial. I think I get a little foggy brained with the sight of new buds, the fragrance of those first flowers....a bit of Spring fever I guess! 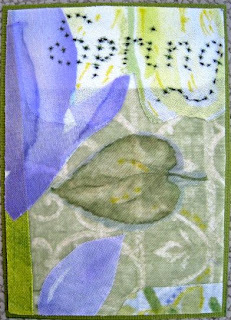 This card is simply a layering of sheer printed fabrics, with a bit of hand painted fabric in the lower left. Everything is fused and the letters, written with a fine marker, blurred a bit, which I actually liked! I received this ATC from my friend Janice last week. 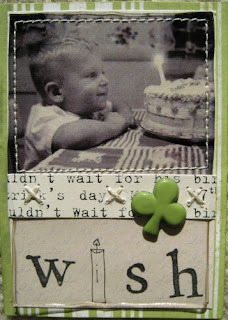 It commemorates the St. Patrick's Day birthday of her brother, John Michael, when he was a little boy. Janice tells me that she printed the photo on a transparency then softened the edges with a flame. I love the added stitching as well as the whole design, but most of all, the sweet look of expectancy on a little boy's face as he waits to blow out his birthday candle.